The blue ensign with the white disc seems to be used everywhere (government site, American Express commericial, the 2000 chart from Shipmate, Znamierowski's books out now). At the opening ceremony of Sydney 2000 olympic games, the Cayman Islands flag was still displayed with the white disk and had particularly well noticable large badge. I noticed that Cayman Flags have changed in 1999. I refer you to page <www.flags.net/CYIS.htm>. The Cayman Islands, a British Overseas Territory ( the FCO has decreed what we used to call "colonies" will no longer to be called dependant territories) has issued A postage stamp in rememberance of 11th September 2001, showing the Statue of Liberty, the US flag, and the Cayman Islands Blue Ensign with the arms in a white disc! The government of the Cayman Islands website shows the flag as is shown on the stamp. As you may know, currectly the XIX edition of the Central American Games are being held in El Salvador. On the flagpoles there are hoisted the flag of the 31 participating teams. The flag of the Cayman Islands is the Blue Ensign with the arms within a white circle. At Athen Olympic Games Opening Ceremony, the Cayman flag had a pretty large white disc around a badge. The atheletes were waiving similar flags as well. Three stars (representing the islands) on a wavy field (representing the sea), with a lion (representing links with Britain) in chief. The crest is a turtle and a pineapple plant. Arms adopted on 14 May 1958. The turtle represents the abundance of turtles around the islands. There is also a rope underneath the turtle which represents the islands first major export: rope making for ships. The motto He hath founded it upon the seas is referring to the fact that Christopher Columbus was the first European to discover the Cayman Islands which were then named "Las Tortugas" by Columbus himself. This is the description of the Cayman Islands arms that appear on the flag. The turtle is the crest and the "rope" beneath it is the heraldic wreath. No connection to the rope industry here, but there are two other Carribean arms that do have this connection: Turks & Caicos Islands and Antigua & Barbuda. Turks/Caicos and the Cayman Islands were dependencies of Jamaica. Turks had its own badge based on the Seal of the colony from 1875 until 1958 when it was replaced by the current shield, Caymans didn't have a badge at all until 1958. The American Express commercial playing on tv these days shows the flag of the Caymen Islands flying from a pole, with the badge in a white disc in the usual place in a blue field UK Blue Ensign. Our website has the same flag shown as an illustration. The World Flag Database has a different illustration showing flag not a white disc, but placed directly on the field. 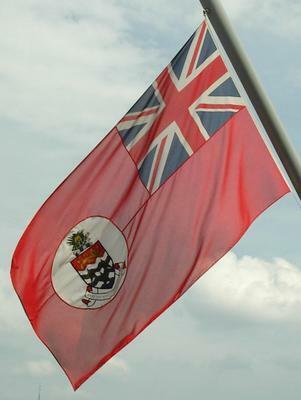 "The Cayman Islands coat of arms consists of a shield, a crested helm and the motto. Three green stars representing the Islands are set in the lower two-thirds of the shield. The stars rest on blue and white wavy bands representing the sea. In the top third of the shield, against a red background, is a gold lion "passant guardant" (walking with the further forepaw raised and the body seen from the side), representing Great Britain. Above the shield is a green turtle on a coil of rope. Behind the turtle is a gold pineapple. The turtle represents Cayman's seafaring history; the rope, its traditional thatch-rope industry; and the pineapple, its ties with Jamaica. The Islands' motto, He hath founded it upon the seas, is printed at the bottom of the shield. This verse from Psalms 24 acknowledges Cayman's Christian heritage. The proposal for a coat of arms was approved by the Legislative Assembly in 1957, and public input was sought on its design. The Royal Warrant assigning "Armorial Ensigns for the Cayman Islands" was approved by Her Majesty's command on 14 May 1958.